Help your friends and family find the perfect RV with the Wilkins RV Referral Program and you could receive a $150 Gift Card for anything in our store. It’s easy! What a great way to accessorize your RV with the help of your friends! Print the form below and have your friends bring it in when they come to view our large selection of motorhomes, fifth wheels, you haulers and travel trailers. After they find their dream RV and make their purchase, you will receive a Wilkins RV $150 gift card. Make sure your friends receive the very best customer service during their new or used RV purchase. Here at Wilkin’s RV, we are dedication to customer satisfaction. Check out a few of the positive reviews we have received from these happy campers. If you enjoyed your RV purchase experience at any of Our Wilkins RV locations in Bath, Churchville, Syracuse or Victor, NY, let your friends know. This $150 Gift Card is our way of saying thank you for your recommendation. This is your chance to go on an RV shopping spree on us! 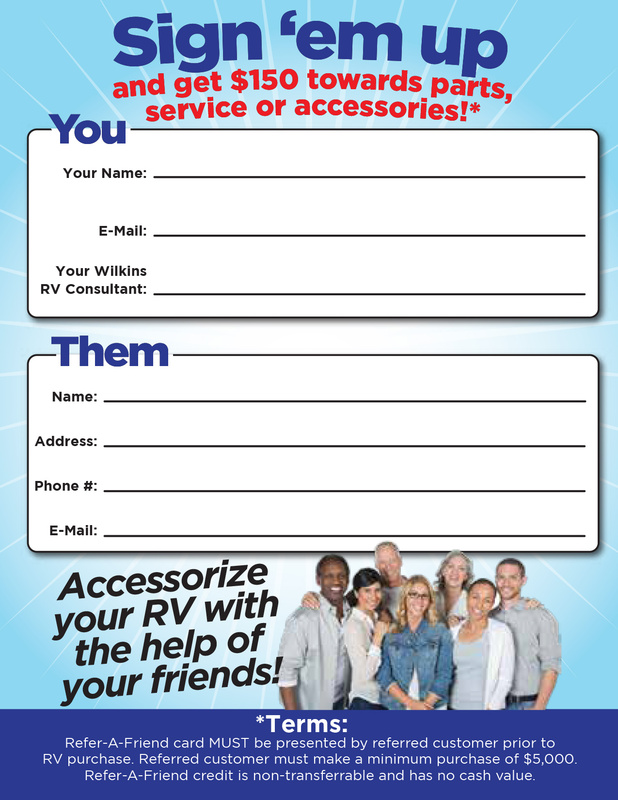 For more information on the Wilkins RV Referral program, Contact Us for details. We look forward to assisting your friends and family in their RV purchase! *Refer-A-Friend card MUST be presented by referred customer prior to RV purchase. Referred customer must make a minimum purchase of $5,000. Refer-A-Friend credit is non-transferrable and has no cash value.